From an outsider’s perspective, a build order is just a build order. It’s an ordered list of units being built. However, there are many ways to both represent and read build orders, and Spawning Tool has added a bevy of options to present build orders differently. machine learning – given many examples and counter-examples of Bio Mine builds, which unlabeled builds look the closest? Our certainty about the labels follows the list above as well: we are relatively uncertain of the labels from machine learning but highly certain on those contributed by hand. The gray area, however, has always been those in the middle: how certain do we have to be to add the build orders straight into the system versus just posing it as a suggestion? 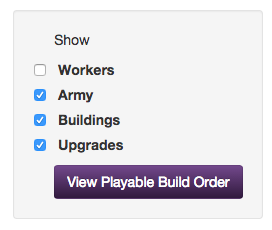 Overall, we hope that this greatly increases the quality and accessibility of our build order data. However, the data can always be better, and we would appreciate suggestions for more build orders that we can add into the system. Our hope is to come up with a broad taxonomy for build orders to label all of them and understand the relationship between them. And even if you don’t have any new ideas, we would appreciate any help approving existing suggestions. We still have over 10,000 undecided suggestions that all of you should feel welcome to adjudicate on. What can we do to make the build order labels more useful?